June of 2015 is the time to reinvent and try new things. Scott Lobdell, Denis Medri, and Tanya Horie are aware of this fact, and have been working really hard for the past two months putting their new business together. 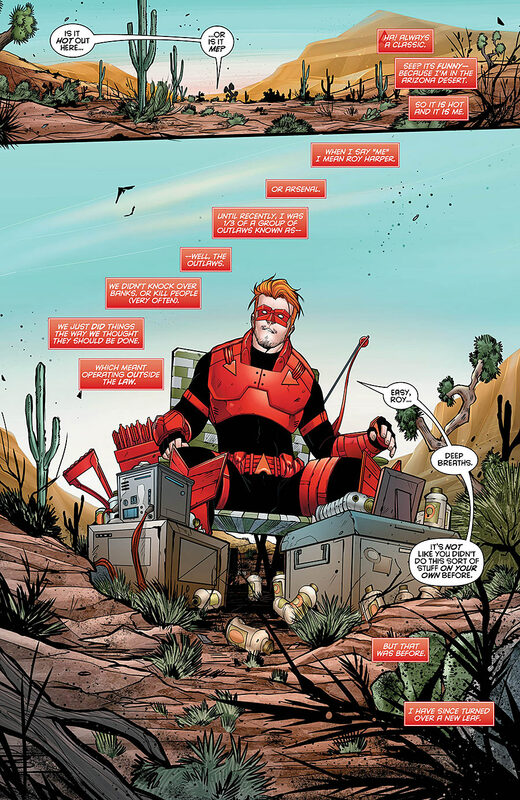 It's a talent agency for those wanting to live a life filled with action, and their first clients are, of course, the amazing Red Hood and his good buddy, Arsenal. I hope the Agency is insured. To QUOTE Hellen Keller: “Alone we can do so little; together we can do so much”. When Red Hood & the Outlaws ended, it ended with every member of the trio parting ways. So at the start of this adventure, it's not too surprising to find Roy in the middle of the Arizona desert, keeping a watchful eye on Washington’s more powerful “fixer”. You see, she's trying to strike a deal with a world renowned terrorist-slash-mercenary, Palette, a guy not known for playing nice with others. As you can only imagine, things go poorly and its Arsenal's duty to save her. Seems easy enough, doesn't it? No. Afraid not. Bad guys trying to do bad things get an arrow in their face, where as good guys are saved whilst the hero gets the lady. Unfortunately, Roy isn't bringing his A-game yet (having a break-up tends to do that to a person) and things really get out of hand, prompting the other party in the book's title to make a dramatic entrance and save the day. Scott Lobdell's script is pretty direct and focuses on introducing the titular characters' status quo after the end of Red Hood & the Outlaws. At the same time he also lays down the seeds for the book’s overarching plot, all of which is framed on an adrenaline filled action scene that spans the whole length of the issue. Although self-contained, this would normally make for a pretty shallow story, but character driven stories are one of Lobdell's specialties. This combined with his strong understanding of the titular characters, makes for a very entertaining read. One could've thought that the loss of Starfire would’ve impacted negatively on the book, but no, the opposite is true. Without Starfire's presence the boys are free to face enemies more on their league and in situations more familiar to them. The undeniable chemistry between Jason and Roy also does wonders to carry the more emotional scenes while their banter is the source of the title's humor. A good story can get dragged down by ill-fitting art, yet thankfully Denis Medri's pencils are the perfect companion to Lobdell's writing. Medri's clean style has plenty of detail on both the characters and the backgrounds, while also allowing for some incredibly fluid action scenes. His characters are very expressive, allowing the reader to immediately understand their moods just by looking at them. Medri is also the source of the boys' new looks, which, I must admit, has been received with some scorn by certain sections of the fandom. But personally speaking, I’ve found them to be perfect for the tone the book is aiming for. Tanya Horie’s colors deserve special mention too, since her hues really bring to live Medri’s designs and make them pop out of the pages and leave a lasting impression on us. Overall I'd say the book is incredibly solid, but it will disappoint anyone looking for long spanning epics or stories that try to reinvent the medium. Lobdell is going for a more serialized feeling (not unlike that of a TV show) and his only goal is to deliver a fun story between two friends having adventures, helping each other to be the best they can be. Let's see, on the one hand we have the pragmatic son of Batman, willing to see justice done no matter how many rules are broken in the process. Whilst on the other, we have the emotional ex-associate of Green Arrow, who wants to help people and maybe make some money out of it. Together they fight crime. I don't know about you guys, but this sounds to me as the classic buddy cop show setup. And so, I picked the buddy cop theme song par excellence: Miami Vice’s theme tune. Two words: Team up. 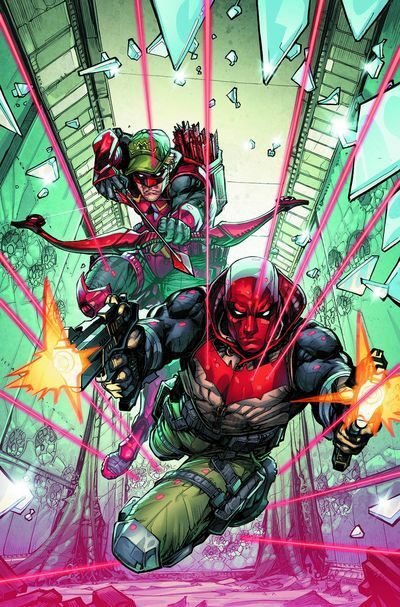 While Arsenal was doing fine on his own, it wasn't until Red Hood joined him that they truly became unstoppable. 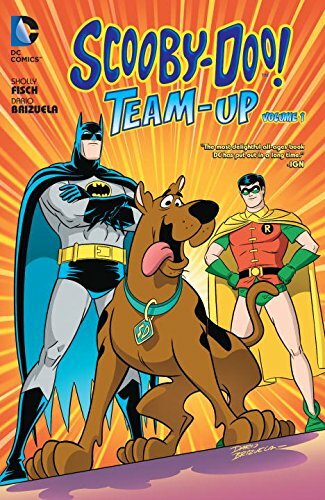 If you enjoyed the characters' previous title (Red Hood & the Outlaws) or if you like action comedies like Tango & Cash or Starsky & Hutch, then this is the perfect book for you; just two friends traveling all around the world getting into troubles and helping people along the way. I for one am eager to see what problems they get into next. Next issue promises us killer mimes, so I'd say we’re off to a great start.